How can communities take control of their broadband future? Many communities continue to struggle with inadequate broadband for their community. Residents and businesses cannot get the quality broadband they need, or any broadband at all. Municipalities are impeded or prohibited in providing new services and the local economy and overall community vitality suffers. Commercial ISPs are unwilling or unable to improve local broadband and yet resist attempts by communities or regions to take control of their broadband future. Standing still is not an option. The status quo will not change unless communities take the initiative. However, the most common approach to solving the problem is for municipalities to build and operate their own municipal broadband network. Credit to those that do this, but in many cases this becomes a continual struggle to avoid operating losses and recover the investment, while operating in the face of strong resistance and competition. Fortunately, there is a better way available to any locality serious about owning its broadband future. It starts by recognizing and embracing broadband as the essential infrastructure of the 21st century. This approach is now possible because of maturing technologies that allow you to build open access virtualized networks that not only provide the digital infrastructure your community needs, but also is a platform that opens a marketplace for internet service providers. You put local users in control rather of their future than having them held hostage to whatever is available, and you can do this without becoming an internet service provider yourself. Let’s go out on a limb and say that there is no municipal leader who wakes up one day and says, “What I really want to do is to become an ISP”. This is only a means to achieve your true goal, which is to ensure that everyone in your community can get affordable, quality broadband if they want it. It is about providing internet access, but it is also much more than that. It is about everything you can do with digital infrastructure and smart community services that will make your community a desirable place to live and do business. Superior, Colorado – Today in conjunction with its underwriters (Corning, Fujitsu, Henkels & McCoy Group, and Power & Tel); Strategic Networks Group (SNG) released its extensive report on city activity regarding the current state of broadband service, smart city applications in use, and investments being made in its “Aspirational Cities” report available online at sngroup.com/cities. The report is a follow-up to last year’s comprehensive state-level research on broadband research. The cities research report can be found at https://sngroup.com/broadband-sustainable-development/. Most participating cities do not have a broadband office and thus, may not have dedicated personnel that can focus on driving economic development, community vitality, and other strategic initiatives through broadband. Nearly two-thirds of cities surveyed do not have any of these three key items in place to advance broadband’s benefits in their communities – funding to support broadband, a city broadband office, or broadband adoption and training programs. Lack of city funding has been the one overwhelming element preventing cities from moving forward with broadband network investments. More than half of the cities surveyed also say a lack of external funding has prevented them from moving forward, suggesting they’re waiting for external solutions that may never come. Only half of cities consider their broadband speeds excellent or very good. “It’s apparent from our cross-selection of cities across the nation that leadership, investment, and strategies need to be put in place at the municipal level to ensure the competitiveness and effectiveness of today’s American cities,” said Michael Curri, SNG’s president and founder. Rick Wilson, Projects and Programs Manager for Florida’s Walton County knew they needed better broadband in his region to increase quality of live and more importantly – promote economic advancement. With a lack of adequate broadband service, Wilson headed to Austin in 2014 to find some answers at the Broadband Communities Summit. Broadband enabled 39.7% of all new jobs from 2013-2015. More than half of new jobs within small businesses can be attributed to the Internet. Local economic growth and secondary investment enabled by broadband expansion is ten times the initial investment. Armed with this and more data, Wilson took a case to the country board of commissioners that investment in better broadband infrastructure was imperative. The board unanimously approved a $1.5 million investment in a cash-strapped county AFTER a final budget had ben approved months earlier. Leveraging e-rate dollars brought a $20 million dollar fiber investment to Walton, an accomplishment that was heralded by both sides of the political aisle. 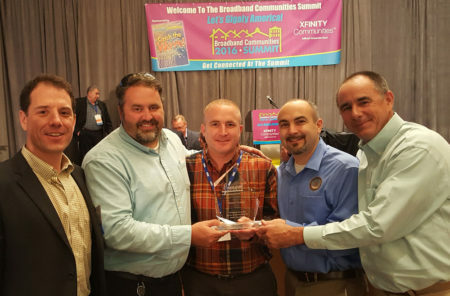 With the build underway, Walton County was recognized two years later at the same Broadband Communities Summit with the Cornerstone Award for the significant community advancements brought about by the current fiber build. SNG Webinar: Is a Locally Owned Broadband Network Right for You? The long-running debate over whether municipalities can build their own Internet networks is more rooted in ideological positions than pragmatism. Should a tax-supported municipality be using its resources to compete with private ISPs? Opinions are often rooted in ideals of whether to let the free market take care of it or to invest public resources. 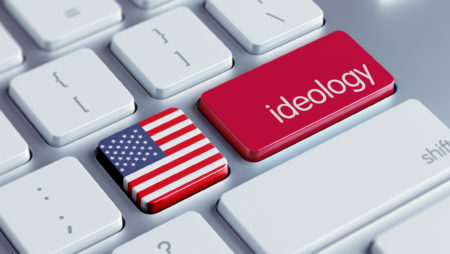 Moving past ideology allows the discussion to address the needs and concerns of both sides of the debate. There are legitimate concerns expressed by opponents of municipal broadband (the private sector) which primarily revolve around the taxpayer risks of committing public resources to build and operate a network. Unfortunately opponents tend to paint a black and white picture, pointing to examples of municipal broadband failures and using this to reinforce a position that public entities should not be competing in the free market. Broadband investment carries with it risk as they are by no means inexpensive to build. Some municipalities have been successful in rolling out a community broadband network while others have failed. But let’s be clear about the real issues driving municipalities in this direction. No municipality wants to become an ISP. Municipal networks are the result of a city/town filling service needs where the private sector has not and/or will not. These communities recognize that if service gaps remain unaddressed, they will increasingly have negative effects on the local economy and the overall well-being of their community. Unfortunately, the muni broadband debate always seems to center on whether or not the network can become a viable and sustainable ISP while competing with incumbents. The reality is that if there was a really good business case for building out and upgrading networks, the incumbents would have done so already. The rationale for municipal broadband networks goes beyond the traditional ISP business case and must also be based on economic development, social equity, and the ability to control a community’s own destiny in the digital world. Advancing communities through broadband is not in an ISP’s mission statement – nor should it be. Evidence clearly shows that better broadband, when used meaningfully, brings communities tremendous economic benefits. Unfortunately this is generally overlooked when debating viability or sustainability as the go/no-go devolves to a narrow “business case” argument and assessing taxpayer risk. Fortunately there’s another way to address municipal needs while mitigating many of the issues and risks – a middle way, both figuratively and literally. 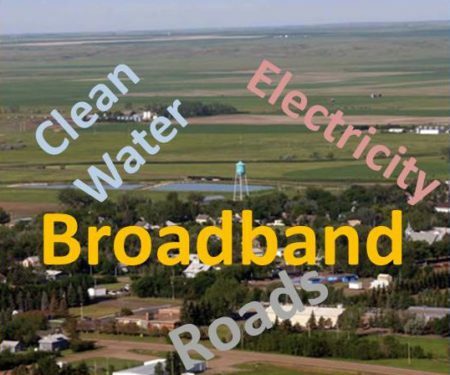 That middle way is to treat broadband as essential infrastructure, similar to providing clean water and roads with which municipalities are very familiar. Taking an essential service approach with broadband can also avoid directly competing in the retail ISP market. How would this work? First, the municipality can invest in their own network for their own needs, something they have every right to do and often need to do for operational purposes. This can be a relative small initial investment to establish a core network to reduce costs to connect their own facilities as well as community anchor institutions, such as schools and libraries. The payback may be over a number of years, but the core network has a starting point. Once the core network is in place it can be extended to serve residents and businesses that lack broadband at all or have to settle for low-speed, low-reliability options from incumbents. A big investment? Yes, if you consider the whole community. However, there is a viable model that reduces the payback risk using broadband improvement districts. Essentially, this is a neighborhood where property-owners opt-in to own the local network infrastructure. Households pay up front on terms that are financed in such a way that their monthly Internet costs are reduced from what they pay now. This is the model that Ammon, Idaho, is using. This is a win-win scenario as additional municipal network investment is paid up-front by committed property owners who also save money monthly and receive significantly better broadband service. By offering only the infrastructure on an open basis the municipality can encourage other retail service providers to offer services at affordable rates over it. Property owners not only save money but have more competitive choice on a high capacity network. The municipality benefits further by eliminating the risk of directly competing on a retail basis with incumbents. This also eliminates taxpayer risk by only building based on committed demand by property owners that opt in. By focusing on building infrastructure rather than being a retail ISP, regulatory constraints can be avoided. In fact, not only do municipalities avoid competing with other ISPs, a major critique of municipal broadband networks, this approach actually increases competition among a wider range of ISPs – something that free-market proponents should welcome. The end result is that the municipality gains sorely needed broadband infrastructure, building it in an inherently sustainable way without assuming the financial or political risks normally associated with the retail municipal network approach. Furthermore, this “pay as you go” approach can potentially work for even small communities that do not have the market size to support the retail municipal broadband model. The reality is that there are still many communities, especially in rural America, that suffer from a lack of affordable broadband of any type or have what is fast becoming antiquated technology. Such communities are at a disadvantage and risk losing economically with erosion of their population and businesses. The incumbent ISP business case status quo will not change. Communities need to take action and assume control of their own broadband destiny with this essential infrastructure. There is a way forward. Dallas, Texas – Today at the Broadband Communities Summit Strategic Networks Group (SNG) announced its new service, the Economic Feasibility Assessment. SNG’s Economic Feasibility Assessment is SNG’s lower-cost, relatively rapid alternative to the traditional feasibility study. It’s a preliminary step to inform and develop a plan for local broadband investment. The Economic Feasibility Assessment uncovers whether a community should invest by quantifying the benefits to be realized in a “what-if” scenario of a locally owned network. SNG investigates real community savings versus investment required and as a value-add offer a forecast for the economic growth a new network could facilitate. The economic investment estimates are provided by leading industry firm AEG. Potential municipal cost reductions compared to existing broadband costs. Cost benefits for community anchor institutions (schools, libraries, hospitals, government buildings). Cost savings for households and the accompanying consumer surplus for local spending. Economic growth from increased business competitiveness and productivity. To read the Economic Feasibility Assessment for Ammon Idaho, visit www.sngroup.com/ammon. AEG offers a full suite of services that aid clients in the successful implementation of their broadband networks. We pride ourselves in innovative client deployments and even developed our corporate culture to support the exploration of all possible methods. Our end goal is to find the best solution for each client. Visit AEG inline at www.aeg.cc. 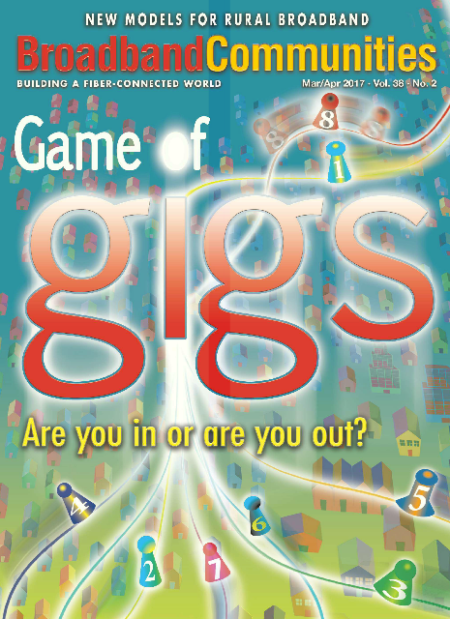 In advance of SNG’s announcement next month of an exciting new offering called the Economic Feasibility Assessment, SNG’s analysis was featured in the pre-Broadband Summit issue of Broadband Communities Magazine. Included in Michael Curri’s article, “A Local Ownership Approach to Broadband” is a deep dive on a case example (Ammon, ID) and the benefits. It’s a deep dive to explain how a locally owned network can pay for itself, saving the municipality, businesses, and households money. 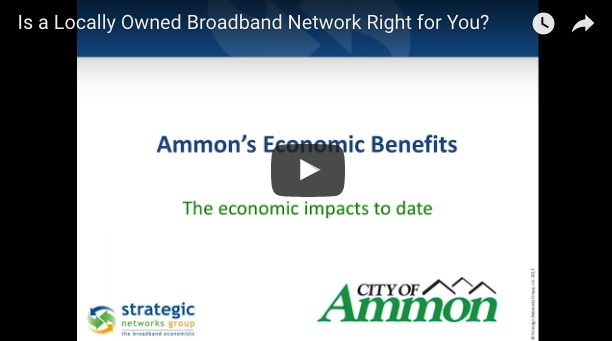 This article is based on the cost and benefits a locally owned network brought to the City of Ammon, Idaho. The Broadband Benefits Assessment is an application of SNG’s Economic Feasibility Assessment – a pragmatic alternative to longer and more costly feasibility studies. It is foundational to a sustainable project and first planning step because it answers the key question: Do the benefits of this broadband infrastructure investment for our community/region outweigh the costs? The Broadband Benefits Assessment applies this methodology to broadband investments that have already been made (i.e. ex-post). Cost summary of network investment. Municipal cost reductions compared to prior broadband and telecommunications costs. Cost reductions for community anchor institutions (schools, libraries, hospitals, government buildings) compared to prior broadband and telecommunications costs. Any community considering taking its broadband future into its own hands needs to understand and quantify the economic and community benefits such an investment would require. In some cases, municipal cost reductions alone outweigh the costs of building digital infrastructure. UPDATE: In February of 2017 SNG provided an update to this report. Today in conjunction with the Rural Telecommunications Congress (RTC), Strategic Networks Group (SNG) released its first of its kind report on broadband investment and activity by American States. The report, available at sngroup.com/states combines FCC availability and adoption figures with SNG’s survey results of 48 states to rank states on the following dimensions: Availability, Adoption, Driving Meaningful Use, Growth Investment, and Regulation. Ranking each state with a weight for each category yielded the following as the top 5 states in terms of broadband; New York, Ohio, Maine, New Mexico, and New Hampshire. Activities most often funded by states are “planning and support” (82% of funded states) and infrastructure (45%). “One overall finding that was interesting is that investment activities seem to be heavily weighted towards the “supply” of broadband and include mapping, infrastructure planning, and grants, surpassing economic development activities that impact economic advancement including raising awareness, training, and driving end-user utilization,” explains Curri. Founded in 1998, Strategic Networks Group (SNG) helps communities and regions transform local economic opportunities, quality of life, and access to essential services through broadband and digital infrastructure. For nearly two decades Strategic Networks Group has been helping communities and regions focus on the ‘demand side’ of broadband, digital infrastructure, and transformation because benefits are the drivers for technology investments – such as a municipality saving 86% in telecommunication and internet costs. SNG is agnostic to technology and network business models which are the ‘supply side’ of broadband. Our mission is to help communities and regions get the best value for their ratepayers from technology investments and to maximize sustainable economic development opportunities in an increasingly digital world. Learn more about SNG at www.sngroup.com. The Rural Telecommunications Congress (RTC) is a national membership organization dedicated to assuring that rural areas in the United States have access to the information and support they need to obtain and use advanced telecommunications services and technology for social and economic development. Visit RTC online at www.ruraltelecon.org. For questions, clarification, or to make sure your state is fully represented in our study, email states@sngroup.com. Strategic Networks Group (SNG) today announced an innovative model for estimating economic impacts generated from increasing businesses’ meaningful use of Internet applications. The model was developed because broadband’s economic impact is shown to be marginal without meaningful use by businesses. Furthermore, SNG’s research shows the majority of businesses are underutilizing Internet applications – foregoing growth opportunities. The smaller the business (90% of US businesses are classified as small businesses), the less they’re using broadband’s applications. The opportunity cost to communities and regions are unrealized economic benefits. SNG’s new Broadband Economic Impact Model estimates the potential economic growth from increased broadband use. The model uses quantitative analysis to reveal the potential economic impacts from broadband for your region based on a variety of broadband utilization scenarios. Powering this model is SNG’s extensive research from tens of thousands of businesses that have reported Internet utilization and accompanying financial impacts. For those who want to look beyond a laissez-faire approach to economic development through broadband, the model empowers regions and states to develop strategies to drive meaningful use and proactively create growth. To see what the Broadband Economic Impact Model reveals about the economic growth potential meaningful use has in your region visit: www.sngroup.com/impacts. Superior, CO – Today, SNG and Shoals Entrepreneurial Center in Alabama announced that the Shoals Shift program will include SNG’s broadband benchmarking, business assistance, and workforce training programs. All of these efforts are focused on capitalizing on opportunities available through the Internet and its applications. Shoals Shift will utilize SNG’s comprehensive and industry-leading eSolutions Benchmarking to help develop digital strategies for the region. Also included in this three-year partnership will be the Small Business Growth Program, a program that shows businesses the economic impacts that inspire greater Internet application utilization, grow businesses, and create job opportunities. The Shoals Entrepreneurial Center (SEC) is a business incubator located in northwest Alabama. Business incubation is a proven tool for regional economic growth. Our business model has a 90% success rate. The Center supports start-up and emerging companies to help them successfully launch and grow. We offer a cluster of commercial space, technical assistance, and a wide-ranging network of partners to provide a critical framework to help entrepreneurs meet their business goals.